When you reach adulthood - 16 years old ingame, you will be able to marry. The couple icon will appear as indicated and you will be able to send your engagement proposal to your intended spouse. After the intended partner has accepted it, the couple must remain engaged for 10 days, after which they can marry at the Town Hall/Grand Council. You will need to formally register your wedding at the Town Hall/ Grand Council in this Age. You are officially married once the Mayor accepted the wedding proposal. There after you can choose to have the union witnessed and blessed before a religious centre ie:- the Church/Shaman. Both of you must be christened prior to the blessed union. An engaged couple does not share a home yet. After 10 days of engagement, you will move in together, into the home of your choice - one of you will have to choose to give up their farm(home) in order for the marriage at the Town Hall/Grand Council to go through. Will our land be bigger after marriage? No, it remains the same. You share the land with your partner, as for how you want to build your land, it's something you have to work out with the other half. Either spouse can perform actions on the land: build or destroy, take care of crops and livestock. It is therefore unnecessary to build everything twice. As for workshop, each sees the trade he/she has chosen. The trade you learnt will remain as your trade skills, you do not lose them, whatever learnt from the previous workshop remains with the character. The home that you see, however, is your own - your spouse will have the same amount of space. 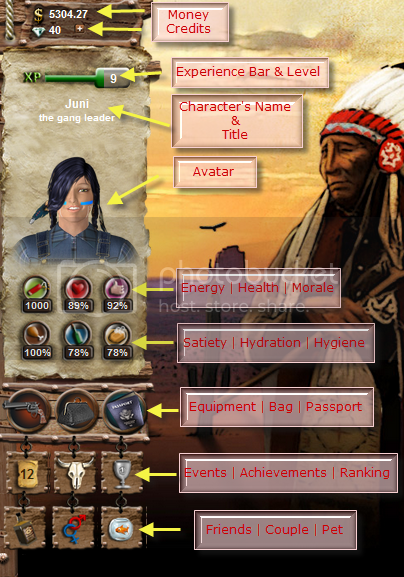 You can use the 'give' option to pass him/her items provided he/she has empty slots at home. So, choose your spouse wisely and communicate with him/her more ! What happens if a married couple decides to move to a Town together? As mentioned earlier, both of you share the same land, and either of you can destroy it to move to a new Town together. What are the couple actions about? In a marriage, it's necessary to maintain the love you have for each other. 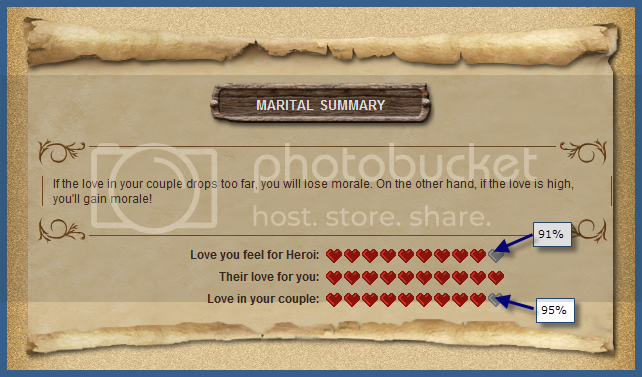 Under the Marital Summary, they are represented by the heart icons meter. If all is well, the hearts meter will be completely red. If love level drops, the hearts are greyed out and hovering your mouse pointer over it will show the percentage of the love level. If the love is poor you will lose morale at the update. The actions last from 7am in the morning to 12am at night (in-game time). You will only be able to do one action a day. There are lots of actions and each one costs a different amount of energy and/or money. They will also raise the love at different levels. The actions are random, everyday they are different. Help !! How do I have children? In order to have a child, you must choose the intimate moment action on the couple page. Both partners must do this action on the same day. You can see the result of this at the update (couple update at 07:00 game time), depending on luck, you/your wife may or may not become pregnant. If it works you must wait a few days until your baby is born. Help !! How do I divorce? My spouse went missing/does not love me anymore/has another lover?? Click on the marriage/divorce section. 1. If one of the partners asks for a divorce and the other refuses to accept it, the separation will be enforced after a 10 day waiting period. 2. If the divorce is agreed upon by both parties, it will be with immediate effect.Take note that it will cost bot parties a considerable amount of energy and morale. In any case, think twice before clicking on the divorce option as it is irreversible.